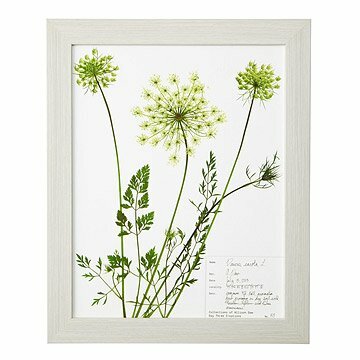 This botanical print is made from an image of a painstakingly preserved specimen of Queen Anne's Lace. Inspired by the precise beauty of scientific herbarium specimens, Allison Daw created this botanical print of Queen Anne's Lace. Her intricate process preserves the plant's delicate, distinctive details through pressing, drying, coating, and mounting a real specimen from nature, and then reproducing this organic ideal through a high-resolution scan and archival color print. The prints showcase every part of the plant's unique structure and subtle colors, and include a detailed botanical identification in the corner. They make perfect decor for any gardener or decorator who loves the elegant intersection of science and art. Printed and framed in Portland, Oregon. For more botanical prints, check out Poppy, Fireweed, and Western Fern. Allison Daw was born and raised in Colorado, where she developed a love for both art and science. In 2007 she earned a M.S. in Botany from Colorado State University, specializing in the evolutionary classification of plants. She frequently collected, identified, pressed, mounted, and labeled plant specimens for use in an herbarium, which is a library of preserved plants used by researchers. After moving with her family to Oregon, Ali sought to combine her love for art and plant science. One evening in 2013 she started making artfully arranged herbarium specimens. Ali's training not only equipped her to create professional herbarium specimens, but also to collect her plants without doing damage to the environment. Her plants are chosen based on their commonness, location, size, and aesthetic quality. Her work has become a family endeavor. Her husband helps with business management, and the whole family enjoys going together on collecting trips and helping Ali scout for the perfect plants.